Reproduction courtesy of the Supreme Court Historical Society. 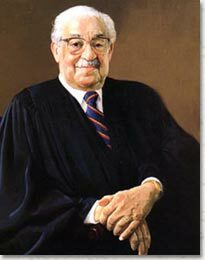 d. January 24, 1993, Washington, D.C.
Thurgood Marshall, the first African American ever to serve on the Court, was the younger of two sons of a railroad porter who later worked on the staff of a whites-only country club. His mother was a school teacher. Marshall graduated from Lincoln University in 1930 and applied to University of Maryland Law School but was turned down because of his race. He then attended Howard University Law School, though his mother had to pawn her wedding and engagement rings to pay the tuition. He graduated first in his class in 1933, just as America was feeling the full impact of the Great Depression. As soon as he graduated, Marshall opened a law office in Baltimore, and the following year he represented the local chapter of the National Association for the Advancement of Colored People (NAACP) in a suit challenging the University of Maryland Law School's policy of segregation. He won the case, and Marshall was brought onto the national staff of the NAACP in 1936, becoming the organization's chief legal counsel in 1940. He remained with the NAACP for a total of 25 years and served as its key strategist in the legal effort to end racial segregation throughout American society. In a series of federal court cases, Marshall and his mentor, Charles Hamilton Houston, set out to reverse segregation sanctioned by the Supreme Court's decision in Plessy v. Ferguson (1896). Since that decision had called for "separate but equal" institutions for blacks and whites, the NAACP argued that institutions for African Americans were not equal to the parallel institutions for whites. A series of decisions ruled in favor of the NAACP, and, beginning in 1945, Marshall began challenging the Plessy doctrine itself. This ultimately led to the landmark case of Brown v. Board of Education, which Marshall successfully argued before the Supreme Court in 1952 and again in 1953. The resulting Court decision overturned the Plessy doctrine of "separate but equal," agreeing that students' self-esteem was harmed by the mere fact of segregation. While the decision applied only to segregation in public education, it set the stage for the civil rights movement. Marshall prevailed in 29 of the 32 cases he argued before the Supreme Court. President John F. Kennedy nominated Marshall to the U.S. Court of Appeals for the Second Circuit in 1961. President Lyndon Baines Johnson appointed him solicitor general in 1965 (the first African-American to hold this position). In 1967 President Johnson created an opening on the Supreme Court by choosing for his attorney general Ramsey Clark, the son of Associate Justice Tom Clark. Justice Clark resigned from the Court to avoid conflicts of interest, and the president appointed Marshall to fill his seat. Marshall is said to have remarked, "I have a lifetime appointment and I intend to serve it. I expect to die at 110, shot by a jealous husband." At heart a New Deal liberal, Marshall demonstrated an unwavering commitment to universal civil rights and civil liberties. He was a staunch opponent of the death penalty and a dedicated civil libertarian. No justice was more consistent in opposing government regulation of speech or private sexual conduct. As the Court became more conservative in his final years and he found himself in the liberal minority, he wrote, "Power, not reason, is the new currency of this Court's decision making." He retired in 1991. John Fox, a writer and documentary film producer, was series producer of the Emmy-winning PBS series HERITAGE: CIVILIZATION AND THE JEWS. Editor-in-chief of the award-winning HERITAGE DVD-ROM, he supervised the creation of its 540-map interactive atlas of world history. He is currently writing a book about the growth of communal intelligence over the centuries.